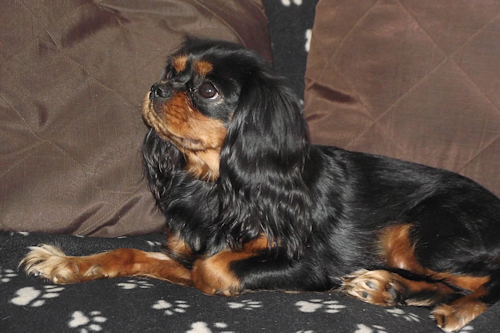 20 Apr ~ Happy 5th Birthday to Honey, Izzie, Murphy, Nero and our own Ziva for today ~ all from Willow's last litter. Whilst the sun is actually shining the move of Katie and her brood went well and they are now ensconced in the puppy area recently vacated by Ziva's little ones and the process of weaning is now well under way. 15 Apr ~ Ours is a very quiet house, ours is ~ well, except for Jade the Grumpy Granny that is. Charlie left for his new home today with his new family and the house seems strangely deserted even though there is Katie's litter of three still here but as they are only just coming up to four weeks old they are, literally, not up to speed yet as they are quite literally just finding their feet. 14 Apr ~ Well the first three puppies left for their new homes yesterday (Mollie, Precy and Reuben), with photo's already coming in of the young ones to be incorporated in their own photo pages, plus Mick and Tricia brought a couple of photo's of Matsy which I will scan and add to her photo page. Charlie, however, will be staying over with us until tomorrow morning whilst his new new family travel back from their holiday, and has been a well behaved young man, sleeping all the night through and being 90% clean - which is good for the first night on his own with no kennel mates. One of the many reasons that I have been a bit lacking in the posting of updates on both sets of pups, mainly to lack of time. With weaning going from strength to strength and then mum barred for the last fortnight, then microchipping by Kim, litter eye test down at Seadown by Mr Mason, health check by our vets and then complete all the necessary paperwork for transfer to the new owners, print handbooks and a goodly selection of photographs for the new owners to see the development of their newest family member growing during the first eight weeks - plus all the necessary daily tasks to accomplish and still interact with Katie and her puppies so that she does not feel put out - and then still find time for nine o'clock puppy mayhem with the adults.......Now we start all over again with Mark, Mervyn and Mary beginning weaning today and then clean down the bottom end of the room in order to move Katie and her babies to the roomier area. These four now have their own photo and pedigree pages which you can find in the usual manner. As well as the sadness/joy of the pups going yesterday we also had the sad news from Roger and Sarah in Australia that Ruby (from Amber's last litter in June 2009) had passed over Rainbows Bridge on Wednesday last. 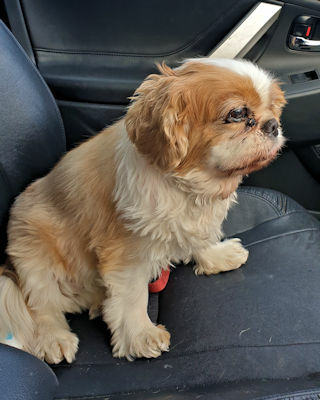 Roger also sent us a photo of the lady herself on her way to the vets a few weeks ago which I have included below and which will also appear on her own photo page. Our thoughts are with them in their loss for no words can voice the wrench one feels when losing a beloved member of the family. 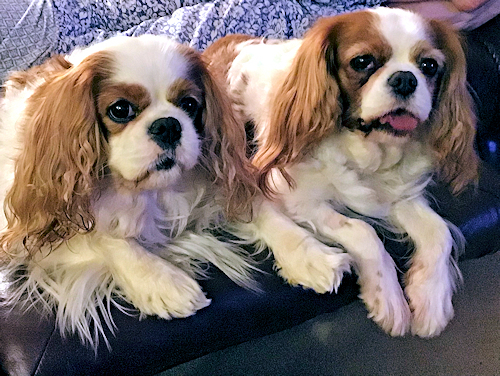 30 Mar ~ Birthday greetings for today to Queenie, Bertie, Buster, Oscar and Timmy from Willow's first litter as they celebrate their 8th Birthday today. 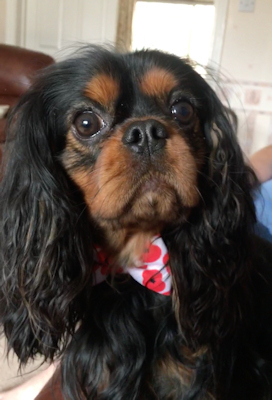 All of Ziva's pups now have their new names with Frank now called Reuben and Finn will now be known as Percy and will join Monty the Cavalier and others (See below). Early lunch for them today as they are all going to be microchipped soon after! Meanwhile Katie's pups are putting on weight at a prodigious rate and are gradually moving around the whelping box with more confidence ~ just a case of waiting now fore eyes and ears to open. Plus yesterday we had a welcoming surprise visit from Amanda and Harley on their way back home from their holidays when he got re-acquainted with the girls in rapid succession ~ especially Abbie the Pocket Rocket needless to say. 24 Mar - Firstly In Memorium to the mischievious Sasha, our first Tricolour who was born in 2004 and sadly lost to us early in her life at only seven years of age. What she would make of Abbie, the Pocket Rocket, Lord only knows. Secondly, we had to say goodbye to little Mia on Friday evening as her health deteriorated rapidly for no apparent reason. Just one of those unforseen realities of breeding I know, but it does not make it any easier when a little one loses the struggle so early on in its life. 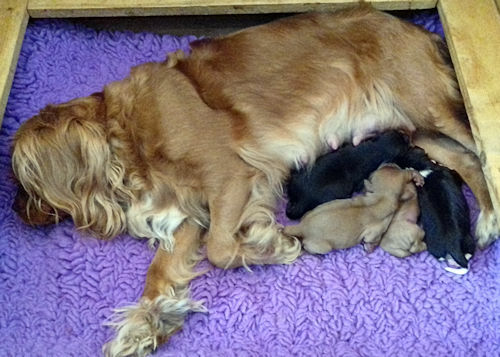 Thankfully the other pups are continuing in their attempts to drink the milk-bank dry as can be seen below. Meanwhile, in the other puppy play area weaning is progressing with it's ups and downs as it usually does, more toys to play (attack/bite) with are now the order of the day and the outside patio is also being introduced to their 'curriculum'. At the moment only Finn has still to find a new home with Fiona now called Mollie, Fred is now Charlie nad Frank is now, well....Frank, until his new owners decide on a new name for him. 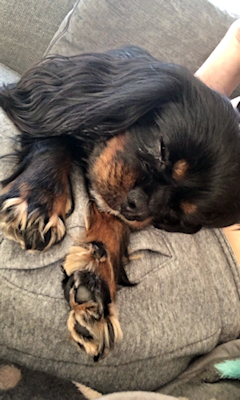 Speaking of whom, in the picture below, Frank is doing a close immitation of a rabbit, he is so comfortable. He could be going to take after his mum in his preference for sleeping on his back. 21 Mar - Well all over for Katie now with the final result, after Oxytocin x 2, ultrasound and an x-ray to confirm, was indeed a Black & Tan boy (Mark), a Tricolour boy (Mervyn) and two Ruby girls (Mary and Mia) ~ plus a very early start to the day and a lot of kneeling and waiting for things to happen because you can't hurry Mother Nature. Photo's of mum with her new children below plus a close-up of same and one of Ziva's family settled in for a siesta in the puppy bed in the big sleep/play area. 17 Mar - 8th Birthday wishes first thing for Teddy, Riley, Holly and Charlotte and In Memorium to their sister Poppy; all from Jade's first litter back in 2011. Next, update on the family front with Frank, Fred, Finn and Fiona all having moved house yesterday to this BIG open space down the dining room end - with much whinging of course because to a little puppy it is just soooo big! Abbie does help(?) to keep them occupied when she is allowed. Needs must though, because waiting in the wings of course is Katie with her impending births who will need the whelping room/study for their occupation. we will be very surprised if something does not happen before next Sunday ~ which is her due date. Anyway here are a couple of pictures of the Ziva tribe in fully relaxed mode in bed and enjoying the Sunday morning sunshine. 28 Feb - Definitely one of those 'Good News, Bad News' weeks this week. The good news side of things is that Monday afternoon saw Katie scanned by Kevin from Fairgolden Ultrasound which resulted in a possible six little babies growing away inside her. Let's hope that this time she has a natural birth and does not have to have another Caesarean. The bad news side is that in spite of all our efforts and supplemental feeding Felix, the micro-pup of Ziva's litter, sadly had to make the trip over Rainbow's Bridge due to health problems. It really is the down side of breeding for us when we lose a puppy for whatever reason. Glad to say though that Frank, Fred, Finn and Fiona are piling on the weight with Fiona now having her eyes opened to see the world. Speaking of the 'little' ones here is a photo of them taken this evening. 18 Feb - Firstly, one birthday to celebrate with Zolo for his 12th on the 20th February and In Memorium to his brother Jonty; both from Sasha's first litter way back in 2006. Plus, for Ziva the wait is finally over ~ two days over in fact! With labour beginning Friday night and 'dragging on' through the early hours and into the day we eventually had to visit our favourite vets for Nazeema to examine her. As there was a puppy in the birth canal an injection of Oxytocin was called for and, with what was probably the fastest reaction on record, literally five minutes later out popped Frank (192g) at 4 o'clock followed by Fred (159g) at 4:05 o'clock and little Felix (110g) at 4:16 o'clock. All three Blenheim boys and as it's February all names beginning with F seemed appropriate for their initial names. Needless to say everything then went quiet and, as Pet Doctors closes at 4:30 on a Saturday, Oxytocin number two was given at 4:45. As nothing had happened by 5:15 we all agreed we would be homeward bound and contact the emergency vets if nothing happened at the end of a two hour period. Needless to say madam started digging on the way home, got through the door and into the whelping box with the boys and at 17:37 along came Finn (185g) ~ yet another boy, but a Tricolour this time. We could not decide whether we could feel another puppy and everything went quiet.......... Until 7:10 when out popped another Tricolour but this time it was actually a girl ~ Fiona weighing in at a gramme's difference from her brother at 184g. Pictures of mum and her babies below. Then in about five weeks time (hopefully) do it all again with Katie!! Proud mum with her babies...... ......Pups are always hungry, however...... ......They do eventually sleep. 28 Jan - Birthday time again and this time it is Happy 12th Birthday to Zak and Monty, and Requiescat In Pace Hollie for the 28nd January ~ all from Lucy's very first litter in 2007. 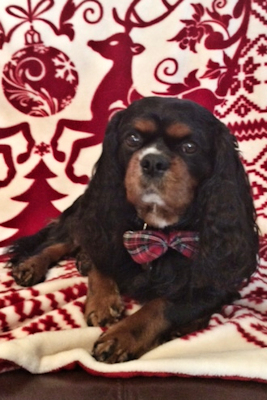 Plus updated photo album pages have been revised for Alfie, Bertie, Buddy, Chunk, Duchy, Izzie, Jasper (2), Louis, Marbles, Matsy, Max (2), Millie, and Nico ~ just fitting updates in around everything else takes more time than you would think I have to say, but I would not have it any other way. 25 Jan - I promised that I would update the website with Ziva's scans when we received them and so, here they are....amazingly even I could interpret them which is unusual for me. Secondly, Happy 11th Birthday for the 25th January to our very own noise machine ~ Jade. picture or two when Kim sends them to us. in a natural birth and not a Caesarean. 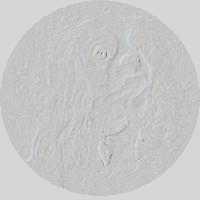 task - especially having received so many new pictures of the, now, grown up ladies and gentlemen by email and snail mail. 13 Jan - No birthdays to celebrate this week but we are off to Kim and see if Ziva (of the ever-expanding girth) is pregnant after her visit to Alfie before Christmas. Then, if our suspicions are confirmed, there should be puppies in about four weeks time. Then to top it all, Katie has decided to come into season early - so in about ten days we shall be heading in the opposite direction to see our friend Chutney in High Wycombe. Guess it means the second whelping box is going to come into use again. It's been a while since we had two litters adding to the mayhem around the home. That's the 'easy' part these days with the new government/local government rules and regulations on breeding. The new form in it's council checklist form is about forty pages of written text boxes which took about three and a half hours to complete with Sue our wonderful Animal Welfare Officer who has to do the whole area on her own - and ours was a renewal. Add another half to an hour for new applications. 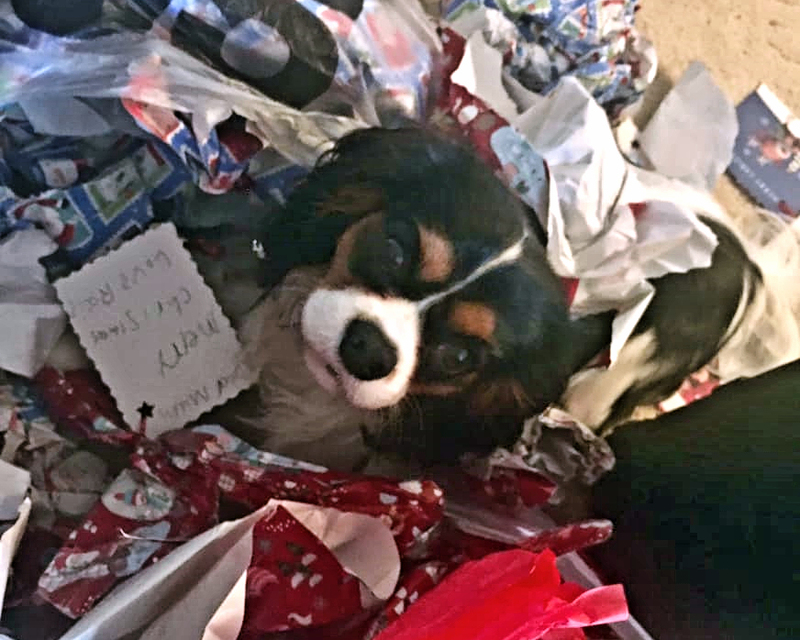 Hopefully it should make it harder for the puppy farms, but I'm not convinced, I think that the amount of paperwork and the shear cost of it will put a lot of small breeders off from carrying on. 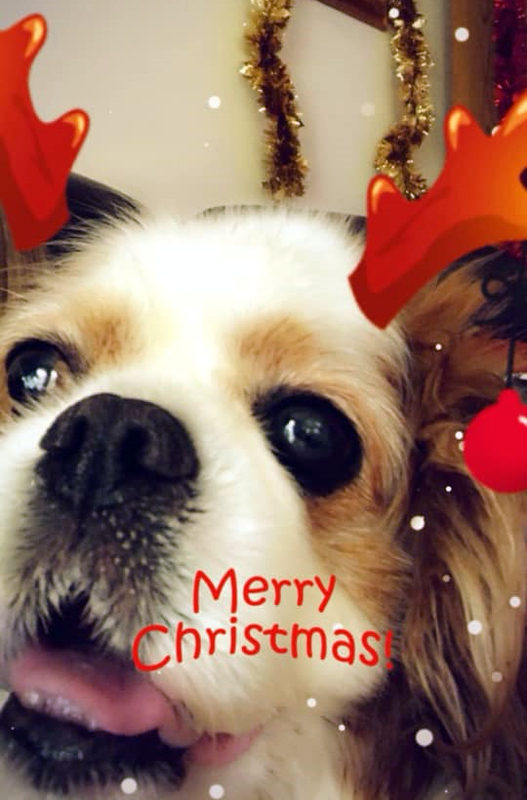 On a lighter note now the Christmas cards have come down I have been able to scan Nico's picture plus I did not realise that I had not added the latest picture of Chunk - apologies to Sydney and family. So here they are. 1 Jan - Firstly we would like to wish all our friends and family a Prosperous New Year ~ may your fortunes be large and your troubles small. 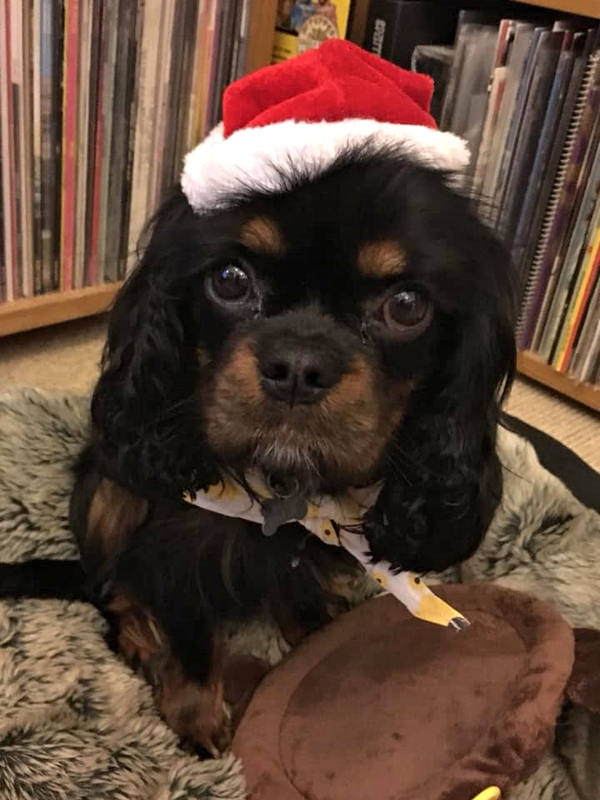 20 Dec - And before the ink was even dry we also received more Christmas photo's of Max from Julie and Rosie & Jess from Vanessa. All looking very well for their collective ages. 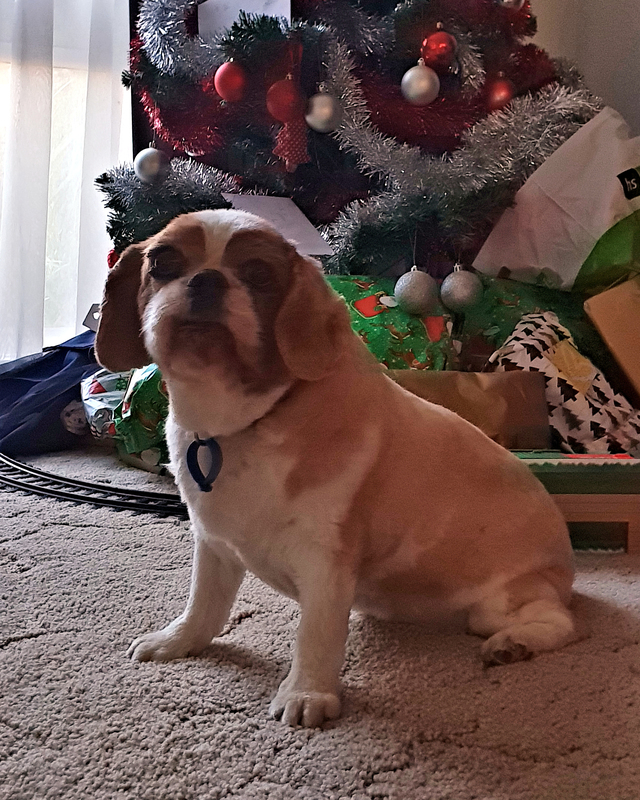 19 Dec -Firstly, Happy 11th Birthday for today to Marbles, Gizmo and Sizzles from our dear Sasha's second litter in 2007, hope you all enjoy your special day with lots of treats. As well as that we have had a busy past few days as on Friday we took Ziva down to Barton on Sea to see Abbie's dad Alfie (Jolainey Rolls Royce for Burleybeck) which as usual involved sitting on the floor for an half-hour. Then Saturday was our daughters 4xth birthday so we took her, hubby Bob and mum-in-law (a mere 93) out for a meal ~ which meant no cooking for moi. Sunday it was the parish Christmas meal and party ~ again no cooking for me. Followed on Monday by my birthday (67 before you ask) so funny old thing we went out for a meal ~ bliss no cooking. Tuesday back to normal ~ yes back to cooking! Following on from that we have also received more photo's which of course will end up on the respective ones photo pages when thing quieten down a bit. First we have Zolo from Sasha's first litter~ who will be 13 in February, then his house-mate Zak from Lucy's first litter ~ who will be 12 in January, next is Jasper from Crystal's second litter at 1-1/2 and finally the young lady called Matsy from Katie's first litter at just over a year old. 10 Dec - Happy 10th Birthday for today to Louis, Coby, Jasper and our own scamp Willow from our dear departed Sasha's third and last litter in 2008 ~ speaking of which here are pictures of Willow and Louis enjoying life as ten year olds and two of Keira (Lucy's sister) enjoying life at 14 years young looking incredibly like her mother at the same age. 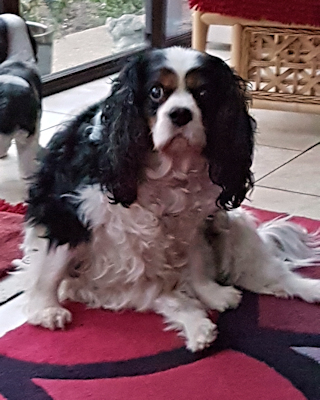 8 Dec - Happy 11th Birthday for today to Bailey and In Memorium to brother Charlieboth from Lucy's second litter in 2007 ~ truly amazing how the years fly by. 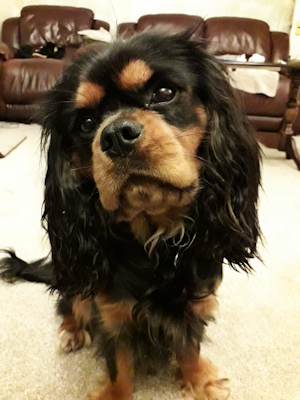 As an aside though Ziva has just decided she will have a season so in about ten days time off we will go to see Abbie's dad (Jolainey Rolls Royce for Burleybeck) ~ watch this space as they say. 27 Nov - Happy 7th Birthday for the 27th November to Stan and Hendricks - hope you boys have a wonderful day. In addition Vicky has sent us a couple of brilliant pictures of Izzie which I have included below. 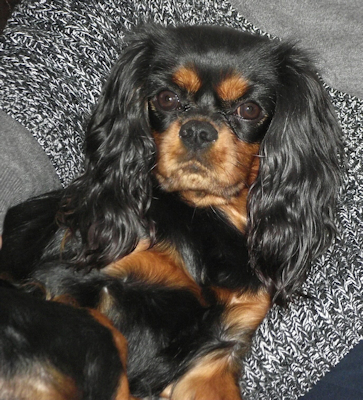 11 Nov - Just received another 1st Birthday photo today - this time it is Cilla marking the occasion. Said photo below with her web page updated as well. 11 Nov - Well been a bit lax at updating the website of late but (as a lame excuse) I am busy working through the last half of the alphabet for photo pages but nonetheless we can always spare the time for birthday wishes and in this case it is Happy 1st Birthday to Bugsy, Cilla, Matsy and Nico from Crystal and Chutney's litter last year. Hope you all enjoy your special day and below I have included pictures of Matsy and Nico which we have just received to mark the occasion. 26 Oct - Happy 3rd Birthday to Mouse and Rosie the brother and sister from Crystal's (Enigmai Lady Crystal Megara) first litter with Ace (Enigmai Sir Triphane Cadmus at Pacchibei). Enjoy your special day. 26 Sep - Just a few birthday wishes today ~ firstly let us wish Keira, Duchy and Ralph a very happy 14th birthday and In Memorium to their litter-mates Lucy, Molly and Monty. and In Memorium to first two puppies we ever bred back in 2002 without which we would not carried on breeding ~ sadly missed. 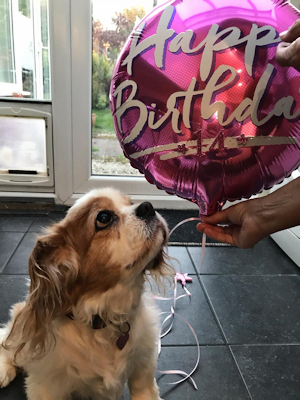 23 Sep - Firstly let us wish Chloe a very happy 14th birthday and remember her sister Buffy. 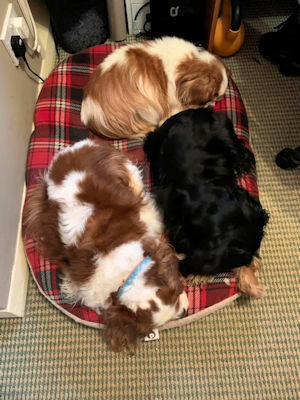 On the other side of the spectrum I managed to finish the compiling and editing of the pups early weeks from birth so now Bo, Buddy, Harley and Ralph's owners can see what fun they were. Still in the process of updating all the various webpages but unfortunately life keeps getting in the way of everything I plan ~ which is annoying as we have received quite a few photo's that need to go on the appropriate pages. 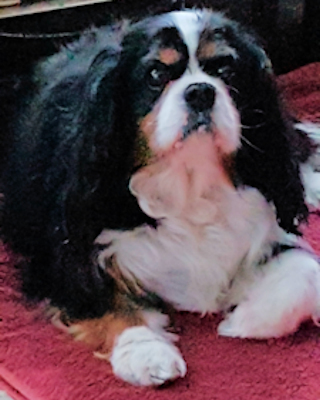 We must also thank the many friends and others for the numerous commiserations and cards on the loss of our beloved Lucy ~ it would have been a lot harder to bear without the pups and the rest of the girls to keep us focused. 31 Aug - Well the end of an eventful month as well as the official meteorological end of summer and I have finaly updated the website with Bo, Buddy, Harley and Ralph's own pedigree and Photo pages. Unfortunately I have also had to update the Rainbow Bridge page to take into account the passing of Jonty, Charlie and Lucy ~ but I have also changed the rainbow poem to a more poignant one. Also, in honour of the perennial granny-ship of Lucy I have added another Lucy photo page dedicated to her love of ALL puppies not just her own. Now ~ all I have to do is edit two months of puppy videos to make one DVD! 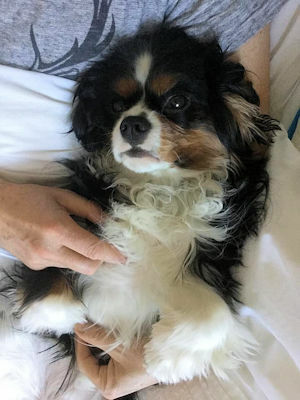 15 Aug - Buster/Geoffrey has undegone another name change and will now be known as Buddy he will be off to live in New Milton with his new owner come Saturday. 11 Aug - Well Bo and Ralph have now departed to join their new families and already it feels strange. Harley is due to depart on Monday but sadly, due to circumstances beyond their control, Geoffrey is now not leaving tomorrow and is consequently looking for a new home. The young man in question is pictured below. 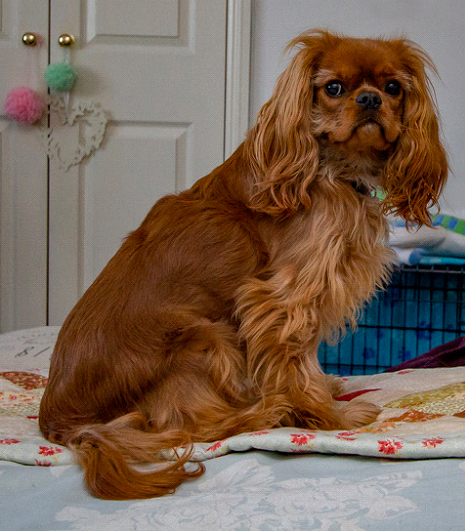 3 Aug - With a very sad heart we have had let Lucy travel over Rainbow's Bridge. All her ills, aches and pains suddenly coalesced today and with the terrible heat meant she could not get a proper drink without collapsing and could not get comfortable in any position so we had to make that terrible, but inevitable, decision. Like her mother she passes on just shy of her 14th birthday - the gentlest of gentle grandmothers and granddaughters who gave us thirteen boys and girls and was always ready to play with puppies. Sadly missed. Here is a photo of the lovely lady I just happened to take this afternoon when she was looking her best.